Will the G-7 meeting be a Kyoto Protocol redux? Here's the scenario: A few months into the new administration of a climate-skeptical Republican president, with the fate of an ambitious U.N. climate change agreement in the balance, the leaders of the world's biggest industrialized countries head to Italy for a high-profile summit. It's a story the world has seen before. With the 43rd Group of Seven talks about to get underway in Taormina, on the Italian island of Sicily, and the 4-month-old Trump administration on the fence on what it will do about the Paris Agreement, veteran climate observers recall that a nearly identical scene played out under President George W. Bush. Some worry that history could repeat itself this weekend. Back in 2001, ahead of the 27th edition of what was then the Group of Eight, world leaders were pushing hard for the newly elected Bush to ratify the Kyoto Protocol. Like Trump, Bush worried that implementing an emissions-reducing pact could cripple the U.S. economy. In each case, the previous Democratic administration — those of Presidents Clinton and Obama, respectively — negotiated the climate deal its successors had to grapple with. Both administrations gave mixed signals heading into their respective summer summits in Italy. At the G-8 environmental meeting in March 2001, Christine Todd Whitman, then head of U.S. EPA, signed off on a communiqué that said countries would "ensure" the "environmental integrity of the Kyoto Protocol." "I remember asking Whitman a question asking whether, just as it was said that 'only Nixon could go to China,' that maybe only Bush could save the world's climate," recalled Steve Sawyer. Climate policy adviser for Greenpeace back in 2001, Sawyer is now secretary-general of the Global Wind Energy Council. He added: "Whitman smiled at me and said, 'Yeah, maybe.'" By the time the G-8 meeting got underway in July, the White House had changed its tack. 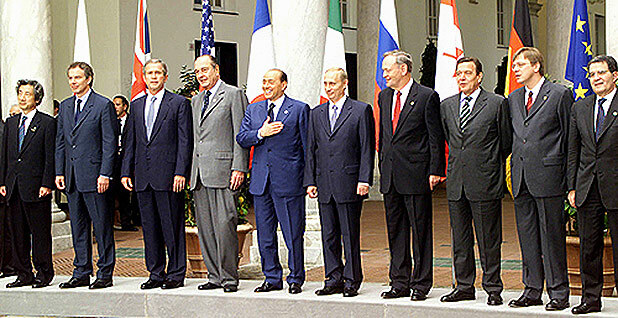 Bush declared he had "no interest" in implementing the Kyoto Protocol, and most of the world leaders who headed to the Italian port city of Genoa for the talks vowed to try to pressure Bush into changing his mind. For the Kyoto deal to enter into force, it required at least 55 countries representing 55 percent of the greenhouse gas emissions from the industrialized world in 1990 to ratify it. With 36 percent of the industrialized world's emissions in 1990, the deal could only enter into force if every other large industrialized country signed on. "The problem was, Russia and Japan were also expressing doubts, and the easiest way to get over the top was to convince the U.S.," said Ermete Realacci, who was president of the Italian environmental group Legambiente at the time and now is head of the Italian Parliament's commission on environmental protection. "That was a big challenge." At the G-8 talks, that door closed. Bush categorically stated that the United States would not implement the deal. Russia and Japan did finally agree, and the agreement entered into force in 2005. But without the United States — then the world's largest emitter of greenhouse gases — on board, the Kyoto Protocol never had the impact expected of it when it was negotiated. The relative ineffectiveness of the Kyoto Protocol set the table for the high-stakes Paris Agreement in 2015. This time around, world leaders again say they'll use the G-7 platform to convince a skeptical U.S. leader to support the Paris deal. So far, Trump, who during his 2016 presidential campaign called climate change a hoax, is playing his cards close to his chest. How much further will the scenario from 2001 carry into 2017? Realacci predicted the two pathways will soon diverge. "Back in 2001, we looked at climate change as an environmental issue, something the world had an obligation to address," he said. "That aspect still exists, but now it's also an economic issue, and most countries see it as a tremendous opportunity for economic development. The agreement will go forward no matter what the U.S. does, and if the U.S. doesn't take part right away, it won't be able to stay on the sidelines forever."